90 years ago was just one year after the Bavarian Socialist Republic was declared and existed for almost a month, and so Bavaria took the threat of Bolshevism very seriously. You may recognize the president Von Kahr, who was later on one of the three ministers forced to go along with Hitler’s Beer Hall Putsch, at least until they slipped away and said that their cooperation had been forced. The putsch won’t happen here in 90 Years Ago Today land for another three years. Captain Escherich, in uniform cap, and President Herr Von Kahr saluting the guard after the president’s address. 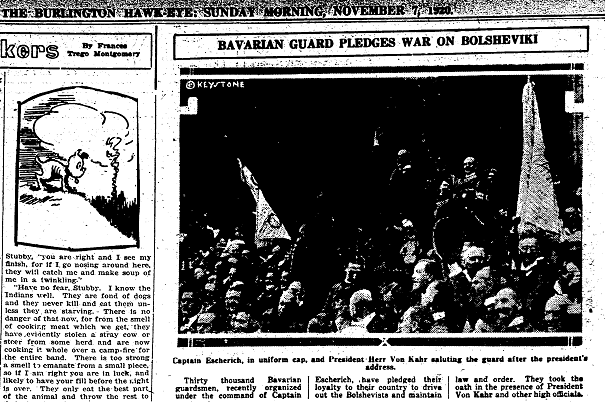 Thirty thousand Bavarian guardsmen, recently organized under the command of Captain Escherisch, have pledged their loyalty to their country to drive out the Bolsheviks and maintain law and order. They took the oath in the presence of President Von Kahr and other high officials. Next is a short article on the cleanliness of Europe’s streets vs. those in the US, and looks rather like something that could easily be written today (air quality, high-speed rail, and any number of other areas where editorials in the US lament their lack in their own country). More Litter in One New York Block Than in Paris or London. New York, Nov. 3. – The large cities of Europe in the point of cleanliness and tidiness of streets are far ahead of New York, Chicago, Cincinnati and many cities in America, says Clyde A. Copson, manage of the Anti-Litter Bureau of the Merchant’s Association, who has just returned from a trip of observation in Europe. “In some sections of New York,” he said, “I can see more street litter in one square block than in any one city I visited abroad. Paris and London are models of cleanliness and comparatively free of street litter of any description. This is due to the fact that the people abroad are more tidy than we who live in America. Mr. Copson said that London has the best organized Street Cleaning Department in Europe, Glasgow, the poorest, and Paris has the best garbage disposal system. referring to taxi-cab drivers and all chauffeurs abroad, Mr. Copson’s statement said that they “seem to know their business and when in trouble or about to run down a pedestrian, they apply the brakes instead of tooting horns. The chauffeurs in New York do just the opposite, hence the greater number of accidents and noises.